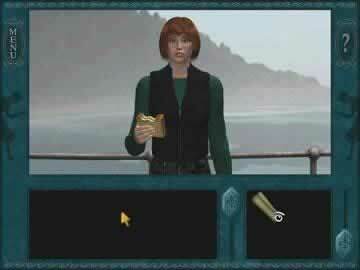 Nancy Drew - Danger on Deception Island Game Review - Download and Play Free Version! Plunge into danger and bring a mysterious island's secrets to the surface! Good correlation between voice acting and animation. Junior and senior detective modes that allow the user to select their difficulty level. Voice-overs easily become tedious and annoying. Background music and sound effects unimpressive. In Danger on Deception Island, you, as Nancy Drew, are investigating a string of mysterious events on Deception Island. When George's friend, Katie Firestone, invites Nancy to Deception Island in the San Juan Islands of the Pacific Northwest for a whale-watching excursion, the sleuth arrives to find Katie's tour boat heavily vandalized. A threatening note warns Katie to "stop meddling." Investigate by foot, bike, and kayak! Navigate sea caves, boats, and the surrounding waters in your kayak. Hop on your bike to explore the Whale Center, Hot Kettle Cafe, and Lighthouse. Walk around town or hit the sandy beach to discover a lighthouse, build sandcastles and more! As Nancy investigates, she learns that the town of Snake Horse Harbor is up in arms over an orphaned Orca whale that recently appeared in the channel and has apparently decided to stay. Is the boat in Snake Horse Harbor related to the orphaned orca whale roaming the nearby channel, or is there a deeper threat shrouded in the approaching fog? 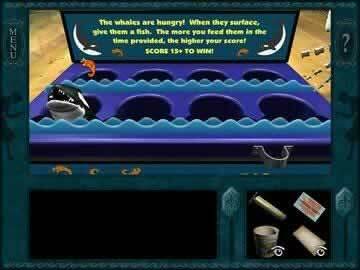 Plunge into danger to bring a mysterious island's secrets to the surface! 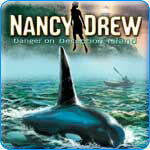 Learn and play at the same time with the latest Nancy Drew release: Danger on Deception Island. A local to the Washington State coast, Katie Fireside is a Marine Biologist, animal activist, and owner of a whale watching vessel who has been vandalized for her fervent enthusiasm to aid a beached orca whale. In your journey to help her cause, much is learned about the killer whale as well as other species native to the region and other helpful skills such as crab fishing. Mini-puzzles are creative and unique, including repairing broken pipe systems, organizing book shelfs properly, solving riddles and much more. Graphics are nothing astounding but are well done, most notably the accurate representation of the landscape of the region as well as character movement and voice acting alignment which match perfectly, demonstrating the highest level of precision. At times voice-overs can become particularly bothersome, including when Nancy exclaims “Cool!” in a shrill voice multiple times in a row while examining animal slides. Background music falls so far into the background that it is easily missed and contributes little to the game. Sound effects are equally unimpressive, but fortunately neither of these components drastically reduce the overall appeal. Although there is both a junior and senior detective mode to suit multiple audiences, both classify on an easy/easy-medium difficulty scale and many “junior detectives” will be more than capable of competing on the senior level. Overall, the graphics are well done and the tasks to be completed fun and diverse, making this Nancy Drew release an enjoyable experience that will teach new facts and skills along the way.